Timber Evaluation - Michigan Lumber & Wood Fiber, Inc. If you have 10 or more acres of standing timber for sale, please fill out the timber evaluation form below and we will have one of our registered foresters consult with you. You can also call us at (989)-848-2100. Timber evaluation form sent successfully. Our registered forester will get back to you shortly! 1.) When was the property last cut? 2.) What are the primary wood types on your property? 3.) What type of cut are you looking for? 4.) What is the estimated timeframe you would like this completed? Do you buy spruce or pine? We are a hardwood mill and do not saw pine species, however our forestry staff can assist you with marketing your timber to other local mills. Call us today for more information. How much land is enough to perform a timber harvest? We typically require a minimum of 10 acres, but forest density, location, and property layout all play a factor. Please call us today and speak with one of our professional foresters, we’ll be happy to speak with you about your property! What area do you cover for buying timber? 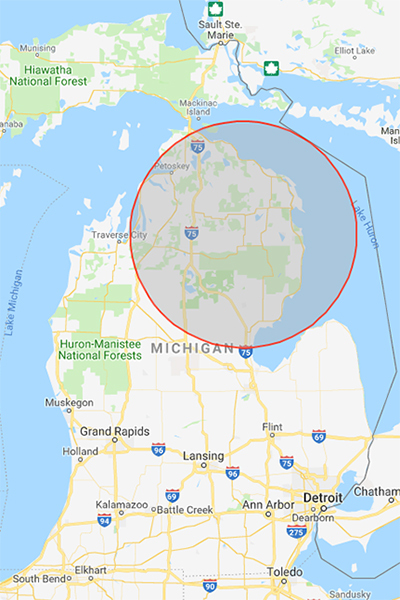 We purchase timber across the entire northern-lower peninsula. What kind of wood are you looking for? Our mill is buying all species of hardwood typically found in the northern Lower Peninsula, including but not limited to: Red oak, white oak, beech, birch, hard maple, soft maple, cherry, hickory, aspen (popple) and basswood.